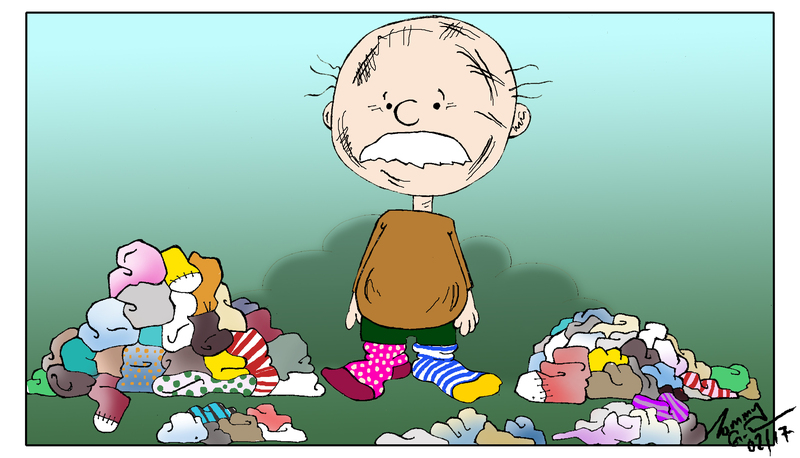 It was three and a half years ago when I first wrote about clutter and socks featured in my post. ( You can look up the post by clicking on Oct 2013 in the Archive ). I was not into de-cluttering at the time, but I did at least tidy my sock drawer as a result. Now in full de-cluttering mode, I had reason to return to my sock drawers, because once again my bedside drawer was full to overflowing. I now have two sock drawers, but no more feet. So where do all the extra socks come from ? I don’t recall getting excessive sock Christmas presents in the past three years. Although I did get some bright red long woolen socks one year from my brother-in-law Garry. They are over the knees extra long and great for the garden on frosty winter days, but I have only been able to wear them out in public at Leicester Tigers matches at Christmas when lots of supporters dress in silly clothes. I must remember to buy him a pink bow tie with spots on next Christmas, I am sure he will love it. Meanwhile, I can let go of my three pairs of light green socks that went so well with my purple velvet bell-bottom trousers. Maybe it is time that I formally announce that my Hippy days are over. I will not be such a style icon in future. The other big conundrum is why do I end up with so many single socks ? Is somebody with a sock fettish stealing them ? Perhaps I should start a fashion in wearing odd socks, then I might become a style icon all over again. There must be a better idea for dealing with how to de-clutter my sock drawer:-). Any inspiring ideas ? Today I just whip out my OAP’s bus pass, and I travel from home free or at a reduced fare to places of interest, or neccessity in and around the Milton Keynes area and its locality. That takes me back to the days of a youngster and transport. As a schoolboy I travelled daily on the West Yorksire Omnibus company’s bus to school Number 51 from Home to school in Harogate with my travel warrant. On Other days I would catch the Ledgard’s local Moorfield Bus to Ottley and there pay a fee and swim in the open air pool (Not heated- and in a picturesques spot on the River Wharfe): Or again with Mum and dad the west Yorkshire Bus to Bradford markets, or a shopping expidition , treat to the theatre into Leeds, or during the day one could catch a ‘limited stop’ Leeds corporation Bus, or again a Ledgards doble decker (Leeds/Ikley service- either to or from Leeds or a day out in Ikley on the Moor). As Yet I have not covered or wiped my nose, or your nose with my ‘boogies’ : These were my hearts desire! It started off with an old metal roller skate and a small plank, sitting on the plank-abeam of the roller skate and facing down hill, and the competition with other scallywags of a time trial between a set of designated house gateposts. If one caught ones fingers under the plank it was or became pretty messy. Then one progressed, or ones friends did to a real ‘Boogie’, a front steering axle with two wheels-a neck board and a seat (Plank broad enough to sit on) with a back axle and 2 wheels, and a loop of rope to pull this treasure up and down the streets or hill-This was the ‘Rolls Royce’ of ‘Boogie’ land. Many other variants became evident, as pram wheel frames from Siver Cross, and many other desirable baby coaches became free and saved or scrounged from the local tip, became utalilies, so many a ‘high bred’ Boogie entered the fray. Then not forgetting as a young wolf cub those exsotic adverts and cinema news reels betweeen the ‘A’ And ‘B’ Films with the ‘Pearl and Dean’ section giving the fun that could be had at the ‘Scout’ soapbox derby- Some memories, Have I declutted yes in a way, but then I remember the short pants the green cub jumper or brown scout shirt and those long knee socks one wore, with ‘Garter Tabs’? Green I think they were for scouts, I cannot remember for ‘Cubs,’ and again Purple for senior scouts. Do I have any? No sadly but my mind drifts back gently to yesteryear- I or my mum and dad and later in life ‘she who must be obeyed declutters my prize pocessions, a long time ago, although I did keep my scout shirt ( and showed it to my young daughters-if they remember that is another tale? I was then approching 50 years of age), that I wore with all my badges and stars/shoulder tabs-for my patrol (Kingfisher- Mallory in the seniors), and before I left the scout troop to join the senior scouts I with my fellow and cub/scout/school friend; we both hiked, camped togeter and on the same day we attained and were awarded our queen scout badge0 Before the days of the ‘Duke of Edinburgh’s Awards for young citezens.. I look now back at the modern prams and ‘buggies’ and no longer can one dream, and make or utalise them for a ‘Boogie’- Remember the sunday newpaper man he would have a pram conversion ‘Boogie’ to carry around the strrets his delivery of neighbourhood sunday papers. David that is a great ramble around Yorkshire and your scouting childhood, just to fleetingly mention ‘knee socks’. Still it reminded me of when l was a pioneer scout in 1966. We went camping in deepest France and watched England beat West Germany in the World Cup. Your post also brought back memories of ‘The Stingeree’. The fastest, smartest, white-wheeled pram in all of Abergavenny. Until I grazed my knee so badly that I had to go to hospital — that prematurely ended my Formula 1 career. It’s the washing machine John. I swear it ‘eats’ up the odd sock (or two) every time I use it. I put a matching pair in and only one’s there when I empty it. Can I have a new washing machine please? Nice try, but that washing machine is good for at least another 10 years. After that I will buy a wash board. I am sure my mum didn’t used to lose socks. Dear John, Will you still love me? will you still care? when I am 64?. You have not ignored me today, so I am offering you a pair of ‘gloves’ not boxing gloves for a spar or bout, but ‘Kid Gloves’ for LO_OOVE! How about that? Too Late I heard the cry! You have rejected me!! and the gift of a paeir of ‘Gloves’ Do you feel lonely old chap! !